Looking for a powerful forklift for intensive outdoor operations? 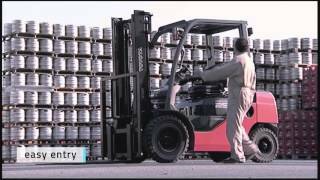 This versatile, diesel forklift truck is both reliable and durable. Safe manoeuvrability and fast acceleration make the Toyota Tonero highly productive, ideal for a range of applications from light to intensive. Designed in-house, the engine is specifically designed for industrial applications and allows quick acceleration and optimised fuel efficiency. This model is available with two engines: 1DZ-III engine: The Stage IIIA compliant engine is perfect for low and medium intensity rack and block stacking. 1ZS engine: The Stage IIIB compliant engine is ideal for medium to high intensity applications and when using heavier attachments.